Today I'm talking about another Free gift with purchase makeup deal and this one is from Revlon. 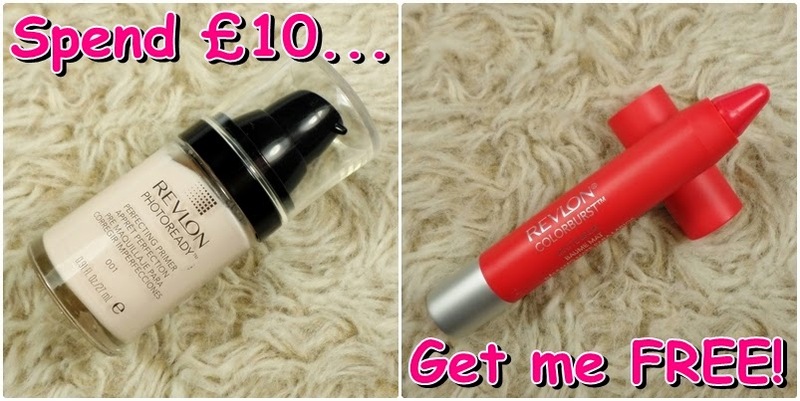 The deal is spend £10 or more on Revlon makeup at Boots and you can choose a Revlon Colorburst Balm for free! There are a couple products that I have been wanting to try from Revlon for a while now so I jumped at the opportunity to try out my first ever Colorburst Matte Balm for free! I've had my eye on the shade Unapologetic for ages after seeing Miss Budget Beauty rave about it! The shade Unapologetic is a bright, almost neon hot pink with a slight touch of coral in it. The matte finish will undoubtedly make this super bright colour more wearable, especially during the daytime as there's something a little bit more muted about a matte finish compared to that of a glossy finish. I do like matte lip products in general but I usually need to apply some lip balm underneath otherwise I find that they can be very drying on my lips. However, with this being a balm, I will be interested to see how comfortable it feels on my lips, even without lip balm underneath. I also like the fact that this is a stain as it should be very long wearing. Once I've tried this out, you can expect to see a full review! After struggling to find a primer that works for me but finally discovering one I love (Max Factor Facefinity) I'm now on a bit of a primer kick. So I decided it was time I tried another drugstore primer and I picked up the Revlon Photoready (£11.99). I've seen quite a few people with my skin type (oily/combination) give this one good reviews although perhaps oddly, it doesn't actually claim to prolong foundation wear time like most other primers do! This primer does claim to minimize flaws and even out skin texture, reduce the appearance of pores and provide a smooth canvas for foundation. This all sounds good to me so I can't wait to try it and see if it works! You can expect to see a full review coming up soon. I wanted to share this deal with you as I think it's always nice to get something extra for free with a purchase. So, if there's something you've been wanting to try from Revlon, now might be a good time to get it! And remember, the Colorburst Balms usually retail for £7.99! You may have already seen me talking about some other free gift with purchase deals from Bourjois, L'Oreal and Max Factor recently. If not, feel free to check those posts out too! P.S. Don't forget to enter my giveaway! It's worth over £40!